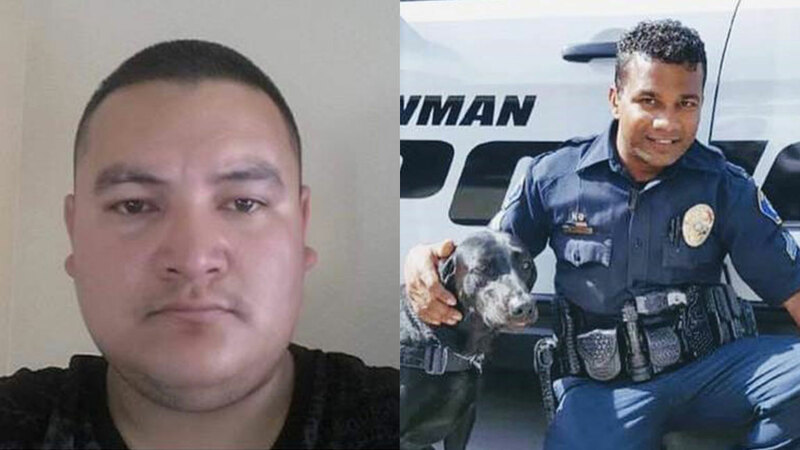 A manhunt is underway for the man accused of shooting and killing a Newman police officer early Wednesday morning, according to the Stanislaus County Sheriff's Department. NEWMAN, Calif. -- A search is underway for the man that deputies believe shot and killed Newman, California police Corporal Ronil "Ron" Singh early Wednesday morning. He is described as a heavy-set Hispanic man with black hair. Sheriff Christianson said that the suspect they have identified was in the country illegally. Gustavo Perez Arriaga (left) has been arrested and is accused of killing Cpl. Ronil "Ron" Singh (right) on Wednesday in the small Stanislaus County town of Newman, Calif.
Singh conducted a traffic stop on a pickup truck in Newman around 1 a.m. Wednesday, for suspicion of driving under the influence. As he pulled over the vehicle, Singh described it to dispatchers as a silver Dodge Ram with paper plates from AR Auto, a dealership in Merced. The vehicle the man suspected of killing Police Corporal Ronil Singh was driving was sold in town, and the folks who made the deal remember the buyer. Moments later, Singh called in for shots fired. Several deputies from both Stanislaus and Merced counties responded, where they found the truck and suspect gone and Singh lying on the ground. He was rushed to a nearby hospital but died from his injuries. The truck was found outside the city of Newman in a mobile home park on Wednesday afternoon, but the suspect was not found in the area. He is still on the run. Police said he is believed to be armed and very dangerous. The Stanislaus County Sheriff's Department is leading the effort to find the suspect, and Sheriff Christianson said his deputies are getting tips from people in Fresno and Merced counties, all the way up to the Bay Area. "We have a lot of officers here not just from our agency, but several agencies throughout Stanislaus County. Our primary goal is to catch the suspect. We have officers, deputies, counselors with the Newman officers, and the Singh family," said Deputy Royjindar Singh of the Stanislaus County Sheriff's Department. Anyone with information pertinent to the investigation can leave an anonymous tip by calling a dedicated line: (209) 525-7202. Tipsters can also e-mail www.modestopolice.com/CrimeStoppers. Singh was a K-9 officer with the Newman Police Department. He is survived by his wife and his six-month-old son. He was a legal immigrant from Fiji, and his parents and brother currently live in the island nation. They are now making their way to California. The officer's canine partner, Sam, is now at home with the Singh family. Chief Richardson said that the dog would be retired from the department early to live permanently with them. "Like I said, please bear with me, I know I won't get through this without having to take a few minutes. This is not a big department, this is a department of 12. This is a man that I saw every day he worked. This is a man who I relieved on Christmas Day so he could go home and spend time with his family and his newborn child. I think what's being lost here is yes, he was a police officer, and that's why all of you are packed in this room. Because he was tragically taken from us. But what needs to be known is that he was truly just a human being and an American patriot. Ron was not born in America. Ron was born in Fiji. He came to this country with one purpose - and that was to serve this country. When I took over as police chief we had some vacancies in the department and one of my first hires was Ronil Singh. He had a thick accent. He was hard to understand at times because English was not his first language. I believe it was his third language. When I sat with him in the chief's interview, he told me he came to America to become a police officer. That's all he wanted to do. He truly loved what he did. You've never seen a man smile more than him. I know that's said a lot in these things. But you ask anybody, he was never in a bad mood. It was unreal. He loved what he did. He loved being a police officer, he loved being a husband, he loved being a father, he loved to hunt, he loved to fish. He loved to go out in the ocean and spearfish, to jet ski, ride his fly board. You have to understand this was not supposed to happen here. I've been to too many of these funerals and I never thought that I would ever have to do this. I do not want to be here today. I would give anything not to. I did not know Christmas morning at 4 a.m. when I said goodbye to him and sent him off to his family, that it would be the last time that I saw him. My department is hurting. We are struggling through this. So please keep in mind when you see them, that it's hard for them. We're a family. We're not an agency, we're a family. The overwhelming support from everyone, from the sheriff's department taking the lead on this investigation. Their overwhelming support to handle the streets while my officers can grieve. The Modesto Police Department, the Oakdale Police Department, the Turlock Police Department, the Ceres Police Department, I know I'm forgetting many. Overwhelming support across the nation that has come in is tremendous and we are truly grateful. I'm sure I left a lot of people out and I'm sorry for that. This was Ron (said while holding up a photo of the fallen officer). He moved the Christmas tree in front of the flag to take his own picture to send to us. He wasn't wanting to work Christmas but he knew he had to, it just fell on his squad and he was okay with it. He was a K-9 handler. His dog there Sam was with him when that tragic event took place. When I pulled Sam out of the car, Sam was wearing a Mrs. Claus outfit that he had put on her, because it was just the kind of guy he was. Just did little things like that, just to bring smiles to peoples' faces. Sure she was a narcotics and he would have loved to pull over a car and use his narcotics K-9 to arrest someone with Sam in a Mrs. Claus outfit, cause he probably would have thought it was funny. Please remember the man, please remember the husband, please remember what he was, what he came to this country to do. Yes, he was a police officer, but more importantly he was a human being. And that's how he would want to be remembered. He was proud to wear the uniform and he does want to be remembered as a police officer. But don't forget the other things, the little things that are oftentimes forgotten in these stories. That his 5-month-old, he will never hear talk. He will never see his son walk. He doesn't get to hold that little boy, hug his wife, say goodnight anymore because a coward took his life. Please help us find this man and bring him to justice. I hope he's watching today and does the right thing and turns himself in. We need closure. His family needs closure. This will never go away, but we need something, a win. We need something so we can move on. Thank you so much for being here. I apologize for my emotions. I hope that Ron is never forgotten. I hope in a week, he is not forgotten."